Scoops is a professional waste clean-up company specifically designed to meet your needs. We come to your house when you need us and clean up the waste that is ruining the appearance of your property. Why should you clean up your dog waste? Dog Waste is not the predominant or most toxic pollutant in urban streams, but it is one of many small sources of pollution that can cumulatively have a big impact if left unmanaged. The New Jersey Department of Health has estimated that there are over 500,000 dogs in the state. Add to this figure cats and other smaller pets, and a significant volume of waste is being generated daily. Dog Waste contains bacteria and parasites, as well as organic matter and nutrients, notably nitrogen and phosphorous. In addition to diseases, the organic matter and nutrients contained in Dog Waste can degrade water quality. When Dog Waste is washed into a surface water body, the waste decays. This process of breaking down the organic matter in the waste uses up dissolved oxygen and releases ammonia. Low oxygen levels, increased ammonia and warm summer water temperatures can kill fish. Excess phosphorous and nitrogen added to surface waters can lead to cloudy, green water from accelerated algae and weed growth. Decay of this extra organic matter can depress oxygen levels, killing organisms. Objectionable odors can also occur. Flies and other pest insects can also increase when Dog Waste is disposed of improperly, becoming a nuisance and adding another vector for disease transmission. 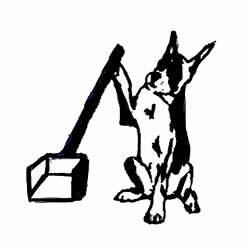 Hire a Pooper Scooper Company: Believe it or not, a number of professional Dog Waste services exist, and they adhere to a strict code of conduct and will provide the most professional and reliable service. Waste left to decay in the yard, will become a problem. To prevent water pollution, have your yard picked up on a regular basis, clean up areas near shallow wells, storm drains, ditches, and watercourses. Always remove Dog Waste from areas where children play….for obvious reasons, kids are the most frequent victims of diseases from feces. Ordinances, signage and education: Many communities have “pooper-scooper” laws that govern Dog Waste cleanup. Some of these laws specifically require anyone who walks an animal off of their property to carry a bag, shovel, or scooper. Any waste left by the animal must be cleaned up immediately. Call your local health officer to find out more about Dog Waste regulations. In recreation areas, trails, and public parks, ‘scooper signage’ along with plastic bag dispensers and disposal cans should be provided. This idea is especially critical at streamside or lake shore walking trails.